For the last few years, Hackaday has been putting together some amazing contests. We gave away a trip to space, but the winner took the money instead. We gave away another trip to space, but those winners took the money instead. But we had a ton of fun along the way and are glad to see some others are getting in on the action. In September, a contest appeared out of the blue on hackaday.io. It is the Square Inch Project, a contest with the goal of stuffing the most electronics on a square inch of printed circuit board. This wasn’t a contest designed, planned, or organized by anyone in charge here; this is a completely organic competition arranged and implemented by the hackaday.io community. A few months ago, a few notable hackaday.io people just decided to have a contest. Awesome. OSHPark was kind enough to give out credits for PCBs as prizes, a we added in a few gift certificates to the Hackaday Store. Apparently that’s all you need to get a lot of people making a lot of cool stuff. There are a lot of really great entries – far too many to cover in a single post – but you’ll find a few great ones below. [Peter] has an interesting idea for a Bluetooth development platform. It has actual debug capabilities, is completely standardized, and is available in a breadboardable package. 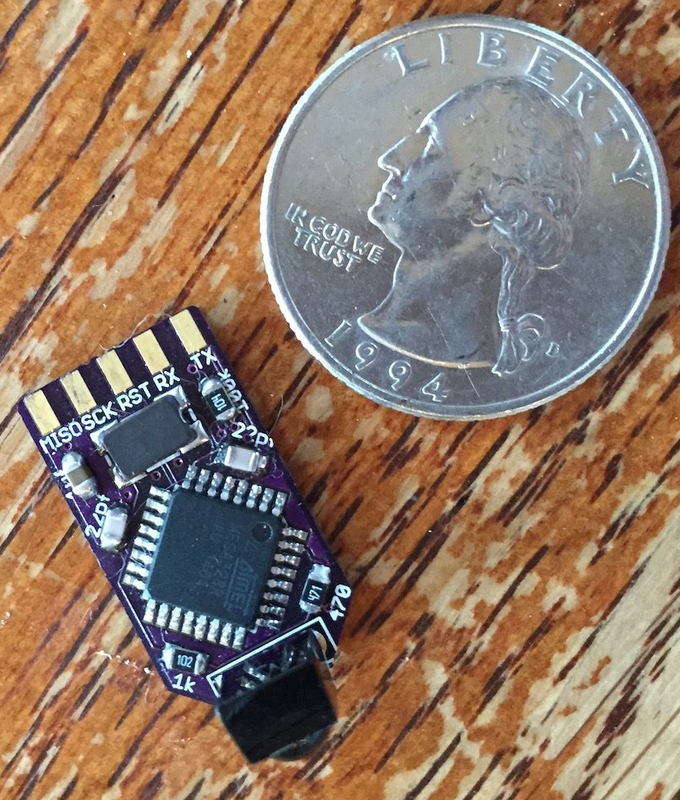 The chip is an nRF51822, an ARM Coretex M0 with Bluetooth built right in. It’s also the same dimensions as a 16-pin DIP, making development easy. All anyone has to do is drop the OSHChip in a solderless breadboard, wire up the power, and program interesting applications that use Bluetooth. Word clocks – clocks that spell the time instead of using numbers or dials – have been around for about a decade. Their construction is actually pretty simple, it’s just an LED array with a mask of letters. Usually word clocks are large, but 8×8 LED matricies have been around for ages. [Daniel Rojas] put two and two together to create the Micro Word Clock. The board is about .79in² and contains an ATMega328, a DS1307Z+ real time clock, and not much else. A grid of 8×8 letters is much smaller than traditional word clocks, and that means there are some strange spaces in the middle of some words. It still looks great, and is a great example of how much you can fit in a square inch. LEDs come in many more colors than just red, green, and blue. There’s an entire spectrum of candy-colored LEDs out there, and if you’re very diligent with reading datasheets you can buy an LED in any wavelength you want. Rohm’s PICOLED series of LEDs come in fourteen different colors, and where there are LEDs, there are blinkey toys. [zakqwy] wanted a rainbow of blinkey and ended up building the RRRRoOYYYYgYgGGBgBPW Blinktronicator. It’s a terrible but accurate name for a project that turns a small PCB into a rainbow. Unicorn not included. Clocks and blinkies are one thing, but a full video game console is another achievement entirely. Stuffing this into a single square inch is a remarkable achievement. That’s what [rossumur] did with his Arduinocade project. This project uses a microcontroller running at 28.6363MHz – a multiple of the NTSC carrier frequency – to play games that resemble PacMan, Joust, and a strange pseudo-3D tennis game. The video tricks used to squeeze performance out of this little chip (and tiny board) are very impressive. That was the reason it previously received its own post. Control input is through an IR joystick, and although this project bends the rules of the square inch project by requiring a breadboard to make all the connections, that’s nothing a small adapter board couldn’t fix. What makes the Square Inch contest interesting is that it’s a completely organic outgrowth of the hackaday.io community. Quite literally, one day a few people just decided there should be another contest on hackaday.io. With over 100,000 people registered on the site, there are more than enough entries for the Square Inch judges to go through. So what’s the next offical HAD contest we can expect? That sounds like a challenge. The HV5622 and similar variants come in TQFP, measuring 12mm square. That’s a mere 23% of one side of a square inch PCB! It really upsets me that people took money over space. I would do anything to fly to space. Shouldn’t this article be listed as a “Hacklet”? Also known as the square 2.54 centimeter project I guess.